is a website builder that allows you to create everything from membership websites, sales funnels, lead generation systems, to product launch pages, landing pages, squeeze pages, and e-commerce systems all with drag and drop ease. It also helps you create your sales funnels so you can sell more of the right products to the right people, including upsells, downsells and basically features that make you more money! Plus they host your website and landing pages for you, or you can use your own domain to redirect to them. is all you need to sell courses from your own web-site. You can get one up and going in minutes. Just click on create a course, add in modules and add in your epic content. Then set up a sale page using their templates, connect it up to your email provider, and your payment tool (more on that next) and you’re off and selling. Even better YOU own your students data and can contact them anytime through Teachable or your own email provider. The interface is clean and super easy to use. Having built around 20 courses over the years, and spending thousands on custom sites, creating everything from scratch, I just wish Teachable was a solution on offer when I started out! It’s as easy as ‘type in your task and hit enter’. You can create specific projects and assign tasks to yourself and your team very quickly and then sync them to your calendar so you get them done. I like that you can manage due dates for tasks, create subtasks that need to be done in order to achieve your main task, leave comments and have task related conversations within the task so nothing gets lost. You can easily upload documents and files and you can view Asana in a list view, by task, by due date or even as a visual board depending on your preferences and how you like to stay organized. WP Engine. These guys are the gold standard when it comes to website hosting and maintenance. Their servers are opti-mized to WordPress specifically which means they run faster and smoother than other companies that cater to any other platforms. They are very diligent when it comes to security too and their customer support and commitment to mainte-nance is excellent. WPEngine is like everything wrapped in a package with a red bow on top! That’s why I host all my sites on them. You should too. Save 20% off your first payment when you sign up here. ConvertKit is my email provider of choice. It’s been designed for bloggers and content and course creators. It has the power of Infusionsoft, but not the price tag and is easier to use than MailChimp. (I still rate Mailchimp too though and Drip). I love it as it combines simple, elegant sending with the automation and tagging features that you actually need. It also has simple landing pages (which they’re now improving) and integrates with other tools in my toolkit, plus you can geotarget where you’re subscribers live to get even more granular and make sure your emails land in the right inboxes to get you results! Zoom is my number one go-to software for hosting online meetings with my team, clients, and small groups of my community members. Zoom has great call quality, screen sharing, and good group collaboration features. It also has webinar hosting features! Zoom is the one tool that allows me to communicate with anyone, worldwide, for free. Just add a decent internet connection and a headset, and you’re set to go! AirBnB connects travelers with places to stay, that aren’t as expensive as hotels, and are more like renting your own apartment or house. World Nomads travel insurance is available to people from over 150 countries and is designed for adventurous travellers with cover for overseas medical, evacuation, baggage and activities such as skiing and snowboarding. Sweet! Running your business from anywhere is not easy, especially if you have no idea what tools to use for the stuff you need done. I’ve been there. I hated it, that’s why I created a list of tools to help you with that. 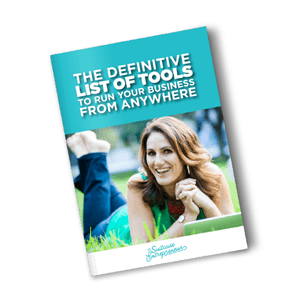 In this Ultimate FREE Toolkit I’ve included the best of the best tools and apps that will help you run your business from anywhere in the world.